Recently I was the very lucky recipient of some delicious Australian Passionfruits from the team at Impact and Passionfruit Australia. They are encouraging Australians to put the passionfruit back into the kitchen this winter and asked me to help out. While I was pondering what to whip up, no pun intended, I was looking at the passionfruit in my fruit bowl and spied a lonely banana who was too ripe for his own good. I then got to thinking about the recipe for a hummingbird cake (banana and pineapple) and wondered how the tropical combo would work with the inclusion of my lovely passionfruits. I decided it would be delicious and set upon creating these scrumptious treats. They say good things come in small packages and these my friend are the proof. 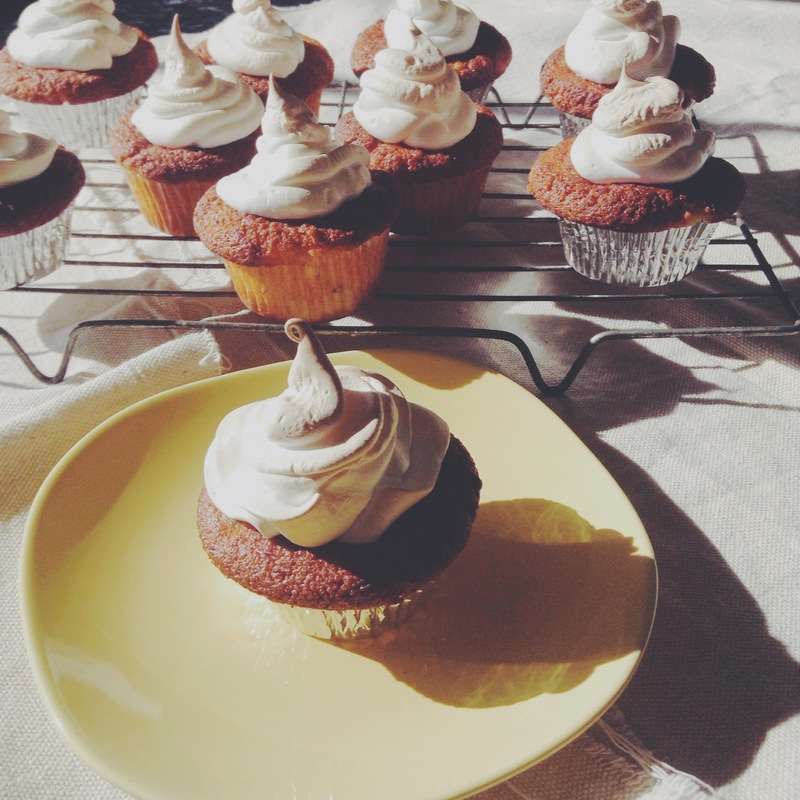 These melt-in-the-mouth meringue cupcakes are perfect for a sweet morning tea treat, dessert or simply to snack on when you walk past them. They might look fancy, but they are VERY simple to make. Also, meringue makes a wonderful icing and I don’t understand why it isn’t used more often. It is simple, moist, gooey and all sorts of tasty. Preheat oven to 180°C/160°C fan-forced and line a 12-hole, 1/3 cup-capacity muffin pan with paper cases. Using an electric mixer, beat butter, sugar, flour, baking powder, eggs and vanilla for 3 minutes or until smooth and combined. Add passionfruit, banana and pineapple. Mix until just combined. Spoon mixture into paper cases. Bake for 20 minutes or until a skewer inserted into the centre of 1 cake comes out clean. Stand in pan for 5 minutes. Transfer to a wire rack to cool completely. Meanwhile, make meringue: Increase oven to 200°C/180°C fan-forced. Using an electric mixer, beat egg whites and sugar to form stiff peaks. You will know when your egg whites are done as all sugar will be completely absorbed and you can hold the bowl over your head with none falling out. pfft gravity. NOTE: you will need to wait for your cupcakes to cool completely before you pipe on your meringue mixture. If you don’t the bottom of the meringue will commence cooking on contact with the cupcake resulting in a hard non-marshmallow meringue. Place cupcakes on a baking tray. Spoon meringue mixture into a piping bag fitted with a 1cm plain nozzle.Pipe meringue on top of cupcakes. Bake for 4-5 minutes or until lightly browned. Set aside to cool and serve. TIP: if you don’t have a piping bag, because let’s be honest we’re not all professional chefs, you can easily make one using a plastic zip-lock bag. Simply spoon the mix into a plastic sandwich bag, push all to one bottom corner, hold tightly and snip the end. A far more detailed video on how to do this can be found here: http://bit.ly/1oKLB7s and don’t worry if you don’t have the nozzle, I don’t!